Art alumni create landmarks for community spaces that reflect society and activate imaginations. John Lovelace remembers campus in the '30s and the '50s. Offering best educational experience in Texas. The golfer was voted Web.com Player of the Year, where he won three tournaments. Documentary features UNT alumni's many weddings. A love for the environment and childhood education shaped teaching career. UNT alumna shares how to live with disability. TAMS celebrates 25 years in preparing the next generation of engineers, scientists and physicians. Former Miss Black Texas USA wins jazz competition and is sailing with soulful vocals. UNT is focusing research efforts on solutions and partnerships. UNT forms two new research partnerships with the Mexican federal government. Four generations of bright and talented Harvill men have attended UNT. Bobby McFerrin works with jazz vocalists and the One O'Clock Lab Band. Jordan Frith, assistant professor of technical communication, explores Smartphones imapact. Communication design alumnae make mark at Ann Taylor, Victoria's Secret and Fossil. UNT's newest enrollment initiatives target the brightest students to create the best workforce. Alumnus looks out for others through My Brother's Keeper. In his latest book, history professor Geoffrey Wawro fills in a crucial aspect of World War I.
UNT alumnus David McMahon earns awards, has fun as David Chicken. Alum earns a place on D Home Magazine's 50 Best Designers survey. 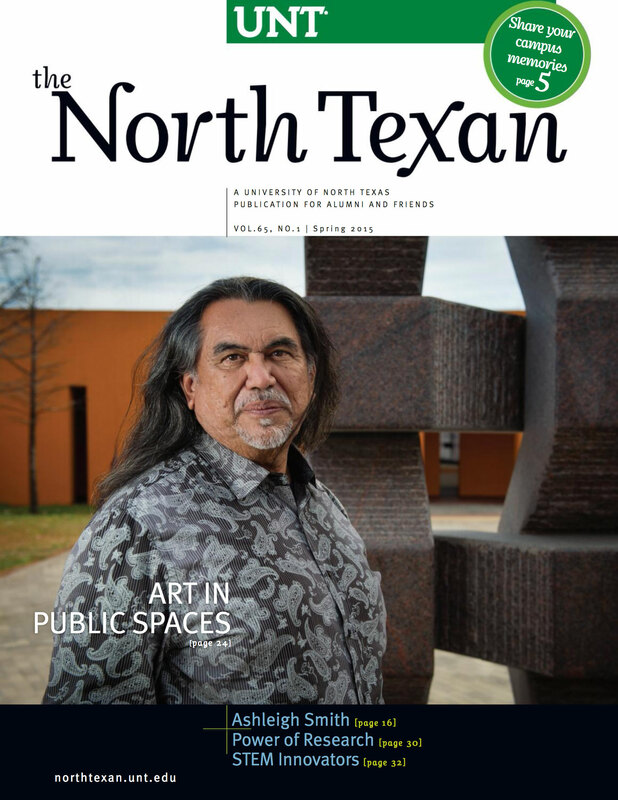 UNT alumnus David Alvarado receives acclaim for documentary "The Immortalists"
UNT faculty member Ruth West brings together art and science for new project. UNT Alumni Awards program moves to fall for 50th anniversary. UNT alum's arrangement used in crucial scene in Oscar-winning movie "Whiplash." Lecrae and other UNT alumni take home Grammy Awards. Mean Green athletics marks highlights. UNT's site in Chile hosts the International Association of Bryology World Conference.